A popular day-trip destination from Tokyo Japan. Teams of samurai parade the street in Koshigoe is the main event of Yoshitsune Matsuri. 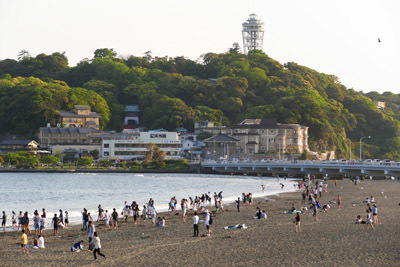 Do you know Enoshima Island in Japan? This tiny island located in the center of Kanagawa, southwest of Tokyo and Yokohama, also in the west of famous historical city Kamakura. 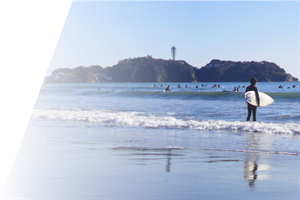 Around the island and Kamakura is one of the popular tourist destination in Japan since very old days by beautiful seascape with Mount Fuji, fantastic sunset, historical sites of samurai, pilgrimage to sanctuary and fresh seafoods. 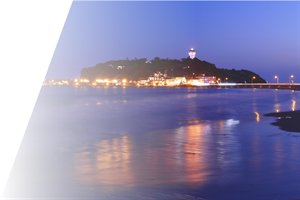 In recent years, it becomes a featured place again as a fantastic illumination event, a rare scenes of a traditional festival involving local trains, a good shore of the nearest marine sports from Tokyo, and a filming location of drama, movies and anime works. 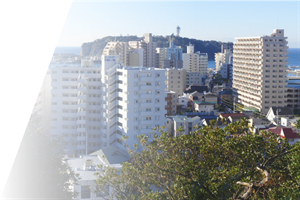 One of the popular tourist attractions, Enoshima Iwaya Caves, is planned to be temporarily closed for repair work several times in the future, please check information at the tourist information office in advance when visiting. 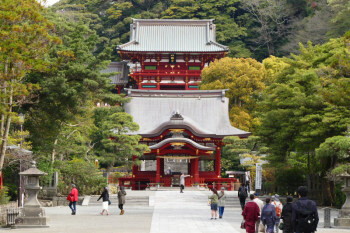 From 1 April, admission fee for Hasedera Temple raised. Kamakura Matsuri is biggest spring festival and event in Kamakura. 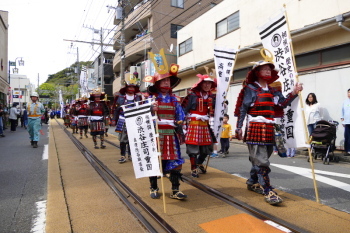 From 13:00 (1:00pm) Yoshitsune Matsuri [義経祭] will be held in Koshigoe town the west end of Kamakura. 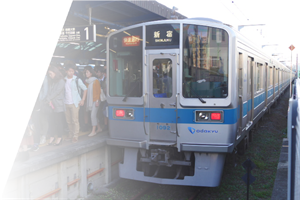 Around 14:00, team of Samurai will depart in front of Ryukoji Temple near Enoshima Station of Enoden Line. 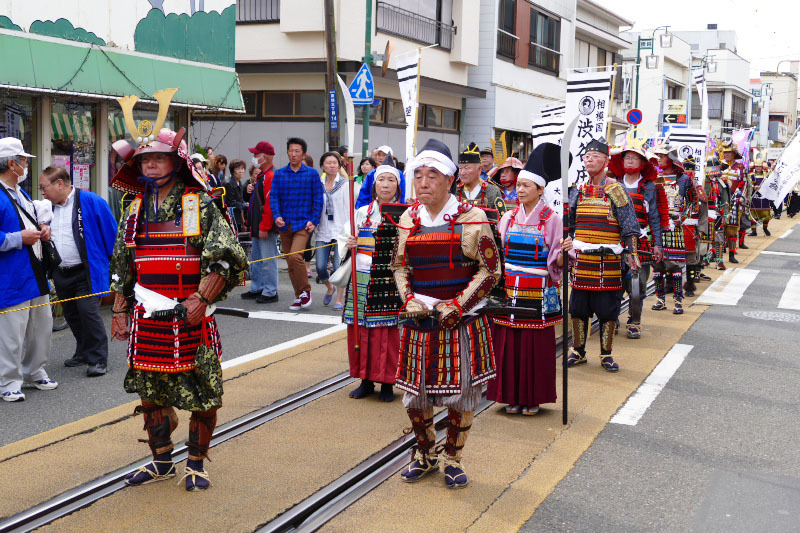 They will parade to Manpukuji Temple via the street along Enoden Line railway. 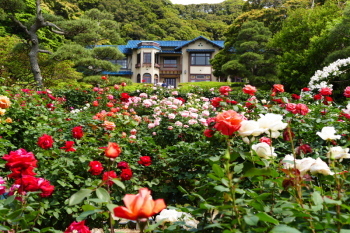 The old Western-style building which was a luxurious villa and the flowers of the blooming rose are one of the popular scenery of Enoshima and Kamakura. 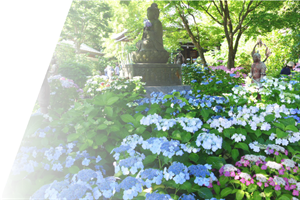 For more detail, please see the guide for flower viewing spots. 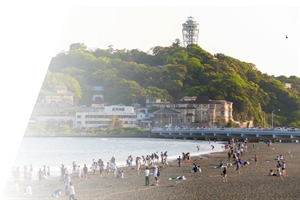 Detailed local guides for Enoshima and Kamakura by the theme and place are listed here. Please choose what you want see or want to know about the area. We expect you will be interested in the area by our travel guide and you will enjoy visiting here near future! 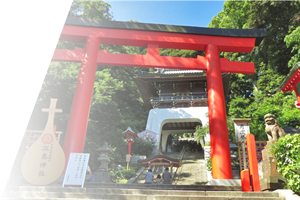 Basic information and fast facts of this tiny island and Kamakura, an ancient samurai's capital city of Japan. Free Wi-Fi info also available here. Tips of recommended attraction and activities to make your trip to the area more great fun. Also introduce some things you need to watch out in the area. Our detailed travel guide by the area taking you to all the sightseeing places in the area from major places to a place only known to local people. Enoden Line is a small train links Fujisawa and Kamakura. It is also a popular tourist spot that remind of the good old days of Japan and a wonderful scenery. How would you like experience the local culture? Get info of the historical traditional festivals and dreamy illumination events and let's go, see and join it! 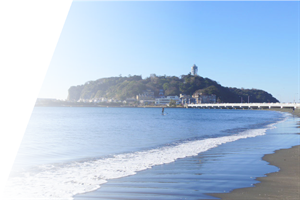 The superb seascape beaches are the nearest natural beach from Tokyo and also popular places for swimming, surfing and other marine sports. 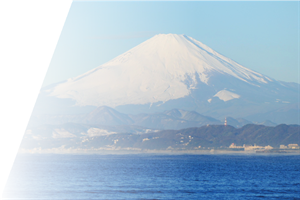 The area is known as a scenic place since old days that the rare and magnificent views of Mount Fuji, the Japan's symbolic mountain, over the sea. 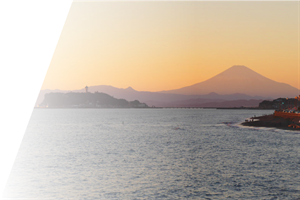 If you visit the area on clear sky day, don't miss to see the one of the most beautiful sunset in Japan together with wide expanded seascape and Mount Fuji. The island is also known as "Cat Island". 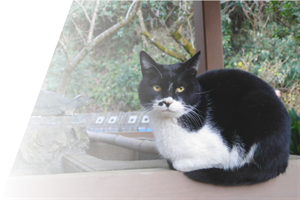 You will see several funny and cute cats while in the island. We'll introduce other small residents of the area too. Thanks to warm climate, various beautiful flowers bloom earlier than the other places around Tokyo. Cherry blossom, Hydrangea, Rose, Autumn Colors and more. 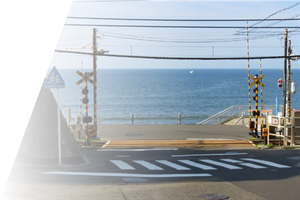 A lot of real places in the area are appearing on anime, movie and TV drama works frequently. Why don't you visit and experience the feel like to becomeing a character? 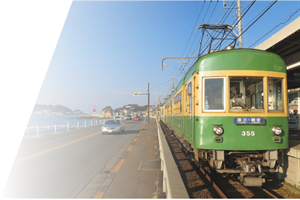 Detailed and easiest train access guide to visit the area from Tokyo, Shinjuku, Yokohama, Haneda Airport and Narita Airport to the seaside. There are many hotels from modern luxury resort to traditional Japanese style "Ryokan" and reasonable guest houses located in the area. Important information for when you are in trouble, illness, and injury while travelling in the area. Evacuation guide during earthquake or tsunami tidal wave also see here. Sometimes, the time and weather show us a different scenery from usual days. 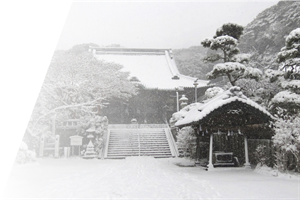 We'll show you such rare or interesting scenery of the area such as snow and fog. Morning caught fresh seafoods are most popular local food. 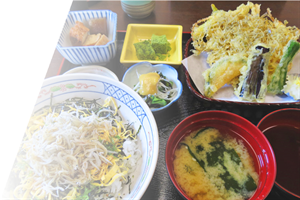 Enjoy them in various style such as traditional Japanese, modern Japanese, western, sweets, snack and more! 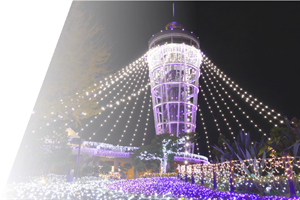 "Six Summer illuminations to Light Up Your Nights"
Apr.09 '19 Upcoming events and festivals info updated. Mar.17 '19 Upcoming events and festivals info updated. Jan.06 '19 Upcoming events and festivals info updated. Would you like to contact us? Please see here.